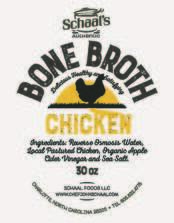 We are very excited to be offering Chicken Bone Broth for sale at a few select retailers around Charlotte including The Vin Master, All Natural Farms at Charlotte Regional Farmers Market and Tip Top Market. ​The animal-based ingredients we use are sourced entirely from local farms within 100 miles of Charlotte whose practices we support as those that raise animals in a way that produces healthy, happy animals, which means high quality meat. This is very important to us in order to produce the best, most wholesome bone broth possible as well as it supports our local farmers, our local economy, and our local food community. If you have any questions about our broth or lard or the farms we source from please feel free to contact me via email at chefjohnschaal@gmail.com or at 608 852 4778.